There is yellowing of the pages of this book due to age. Shipped to you from Goodwill of the Valleys, Roanoke VA. Thank you for your support! Fair. The cover of this paperback book has curled corners. This paperback book shows normal wear and tear. This book's text has light highlighting or underlining. The pages show normal wear and tear and/or folded (dog-ear) pages. There is yellowing of the pages of this book due to age. Shipped to you from Goodwill of the Valleys, Roanoke VA. Thank you for your support! For anyone interested in psychology this book should be your starting point and used repeatedly to keep you grounded. 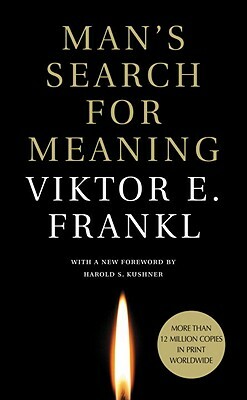 This is an important work, both the first half about his time in the Nazi concentration camps, and the seond half that explains his philosophy on "meaning". This books reputation had reached me years ago after reading the '7 Habits of Highly Effective People.' It is a great book for anyone interested in getting a healthy perspective on their life. It is two books in one. The first part about the authors time in a concentration camp and then about how this experience was implemented into his medical practice. There is a great bit in the book when he states his belief that no matter what happens to you in life you can always choose how you respond.